The following pages detail some of the more advanced strategies that you'll use in RollerCoaster Tycoon 3. For a more basic overview, check out the first part of this RCT3 guide. The first part of this guide covered the various rides available for construction as well as some money basics, but now it's time to move past amusement park basics into more demanding territory. 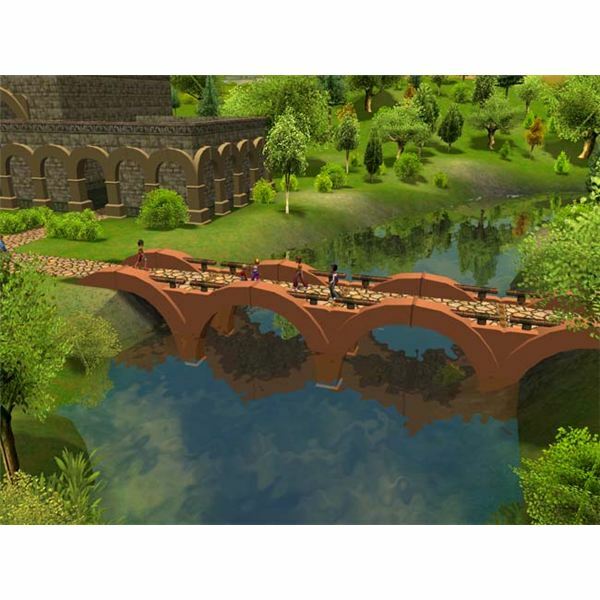 Now you'll learn how to design awesome coasters of your own, landscape areas to make thematic sense, and ensure the smooth operation of your park with a staff of your very own. It's not enough to just put rides in your amusement park and hope that peeps (the game's term for park visitors) show up in droves. The difference in profitability and sheer coolness factor between a well designed $50,000 park and a poorly executed one are night and day. Spreading a little (though preferably a lot of) TLC over your amusement park will boost your bottom line and make it look like a park you'd like to visit in real life. Unsatisfied with the track designs and building architecture available out of the box? The beauty of PC gaming is that there's usually an accompanying mod community, and people are more than willing to share their RCT3 custom track and building pieces with the world. Thankfully, RCT3 custom support is built right into the game, so you only have to download the sets and put them in the right folder in your RCT3 install folder. There are completely new track designs, but there are also subtler modifications, like changing coasters' support beams. The heart of this guide is the custom track editor though, and this tool's what you'll be using to design your park from the ground up. Once you have all the extra modifications extracted to the RCT3 folder on your hard drive, boot up the sandbox editor from the main menu and make a new roller coaster. Instead of choosing an existing design, click the custom track button. You'll want to start with the coaster's station first since that's where peeps load onto the train and unload once the ride's complete. Most roller coasters need to make a continuous circuit before you can open them. Others shoot out in a straight line and travel up a vertical hill before gravity pulls them back down to the station, all without making a single turn. The station is the most important piece of roller coaster track you'll lay since it has to be connected to a path for peeps to use it. You can also edit existing track designs by building them and opening up the construction panel. Choose a place on the track you'd like to change, delete that segment, and build out from there. Familiarize yourself with ride ratings first before messing around with coasters. RCT3 custom coasters give you an opportunity to create awesome tracks, but they're also at risk of being too intense for peeps to enjoy. There's no substitute for some experience, but this guide can at least give you a heads up of what to expect when you start building your first coasters. First, you want to keep things in proportion. Don't feel that you have to copy real life coaster designs, but emulating them will set you in the right direction. With that said, a roller coaster which is 400 feet high and goes 120 mph will probably be too intense for peeps. Intensity rating increases when there are excessive g-forces at work, so a coaster going through loops and turns at high speeds will make your coaster unbearable. That doesn't mean you should leave out those loops and turns. A ride which does one thing repetitively, like a coaster which mainly goes straight, will have a low excitement rating, and that will cause peeps to grow disinterested with it as well. The trick is to balance excitement against intensity and excitement (a high nausea rating is very rarely high enough on its own to turn away peeps). A max roller coaster drop of 100-200 feet should be sufficient, and if you find the intensity rating is still above 9, consider breaking up the single, huge drop into a number of smaller drops. Choose larger loops and curves at higher speeds and save smaller turns for slower trains. Putting special track pieces at the tops of hills rather than at the bottom is another way to reduce the speed at which coasters take those turns. A good rule of thumb is to make your coaster only about as fast at the first drop as it needs to be to complete the entire track. Excessive speeds only contribute to a higher intensity. There's no limit to what you can build in RCT3. Know that roller coaster which looks like it goes underwater? Here's a picture of it to the right. There's no reason why you couldn't do the same. In fact, the game rewards that kind of creativity. Landscaping, especially water features, give nearby rides a substantial excitement rating boost. Going underground and over water at the same time will make your coasters even more appealing. You can always go for racing coasters as well, like the Lightning Racer at Hershey Park or the Dragon Challenge at Universal Studios' Islands of Adventure. Many players overlook all the vertical space available to them. Consider starting a roller coaster fifty feet or higher off the ground. If you're building the coaster in a ravine, build it at the top, and instead of a chain at the beginning to raise the coaster up, just have the track drop immediately out of the station. 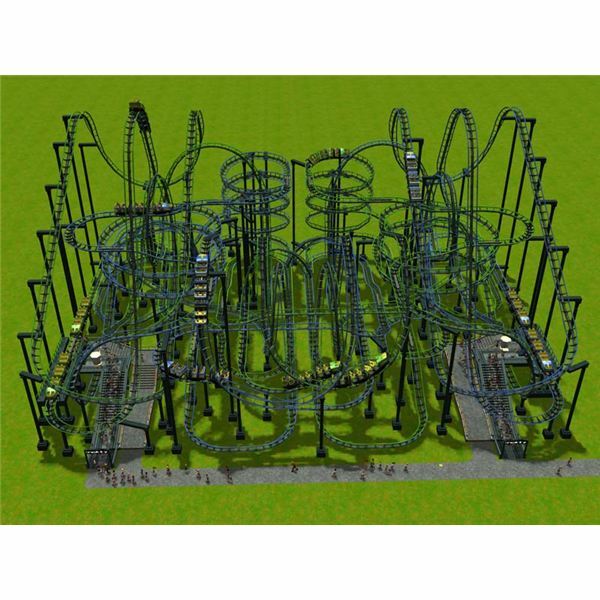 Weaving coasters together can present a huge challenge, but you'll save on room and create some wickedly complex rides. 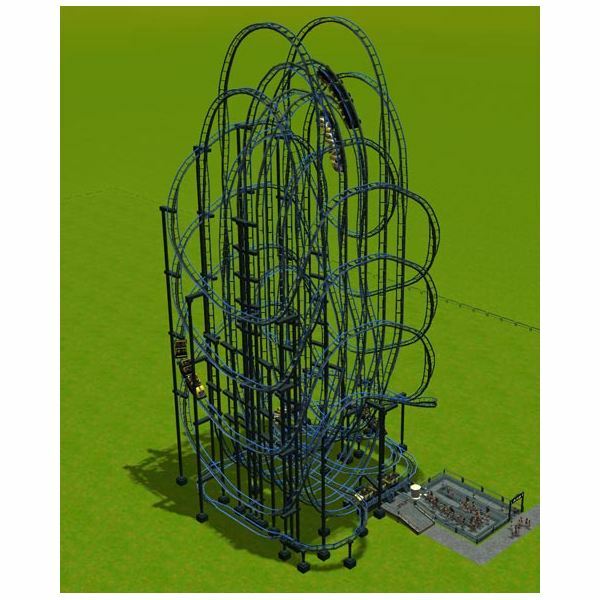 Imagine one coaster shooting straight through another coaster's loop or a vertical coaster diving straight through a helix. It's also a smart idea to build your park around big rides. If you construct a giga coaster which takes up 50×30 tiles, build that coaster before populating the area with smaller coasters and thrill rides. Pre-designed coasters are the death of creativity. Don't rely on them because you can, with a little practice, use your park's space much more efficiently. The landscaping toolset in RCT3 is actually fairly comprehensive, even on par with most strategy game map editing suites. Basic land shaping tools allow you to raise and lower ground. Since ground is organized by tiles, each tile can be raised and lowered independently of one another. However, pathways along the ground can't have broken edges, but you can fix any jagged edges with the remove broken edges tool. Of course, there are plenty of other tools to mess around with. On a purely aesthetic note, you can change both terrain tile and cliff textures, which you can access by raising or lowering tiles in increments, but textures don't have any benefit other than looking pretty. When you're dealing with extensive terrain height differences, pathing becomes an issue. You want to minimize the amount of time peeps spend around simply walking between rides and other attractions, and hills not only space rides farther apart but tend to add a few more pathing tiles as well. Next, you'll want to start populating your amusement park with trees, shrubs, buildings, and other decorations. The only effective way to get it right is to build and landscape at the same time. Don't build several acres of coasters and then attempt to make your park look pretty. Get a rough idea of what you'd like to do, then start laying out track and scenery at the same time, switching back and forth as the area starts to come together. 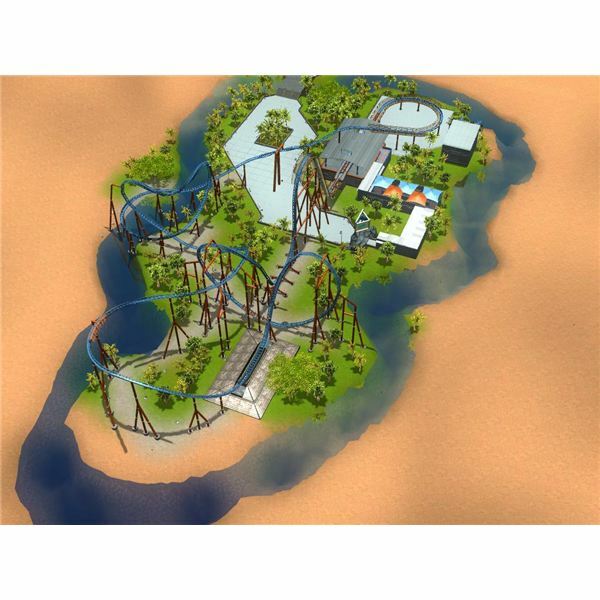 RCT3 water looks surprisingly good for an aging game, but it can be tricky to get just right. When using the water tool, water will fill up all the terrain beneath the spot you clicked. Waterfalls look great too. Just build two bodies of water of different heights close to one another. Click the waterfall button and both bodies of water, and the waterfall will automatically appear. It takes up considerable space, but it's a big crowd pleaser. Most of the time, RollerCoaster Tycoon 3 themes don't matter. There are a select few scenarios in which guests want to experience a particular theme as they meander throughtout the amusement park, but those are the only times that you absolutely must theme an area to advance. You should theme most of your parks simply because you want to give it that little extra finishing touch, but themes are aesthetic more than substantive. With that said, you want to keep themes separate from one another. It doesn't make any sense to have sci-fi themed rides mixed in with haunted buildings and adventure plants. Themes are available under most "build" panels: rides, shops, buildings, and decorations. They're all selected by default, but you can narrow your search by deselecting their respective icons. Your theme preference will carry over from one build panel to another, so if you select the adventure theme for decorations, only adventure rides will be visible when you open up the ride construction panel. As previously stated, RollerCoaster Tycoon 3 themes are optional, but there are a few areas in which they can help your park other than looking cool. Thinking the whole way back to ride ratings, max ticket prices are influenced by a ride's excitement rating. Constructing a unified theme for a ride can actually increase its excitement rating by a few points. Just make sure buildings, path features, trees, other vegetation, and decorations all match up. Choose one of the themes from the list above and stick with it. You'll want to start theming with the rides themselves, and this step doesn't cost you a penny. You can choose the ride's entrance, exit, and queue fence for free. The boat entrance and exit work for theadventure theme, and you'll also want to select pirate fencing. If you have some spare tiles, try constructing a small building. The Caribbean tileset allows you to build some castles and bamboo structures. Put torches and log benches along pathways instead of normal lamps and chairs. Pirate animatronics, palm trees, and chests of golden treasure all contribute to the area's theme. If you're trying to create a theme, a half measure isn't going to cut it. Go all the way to get the best excitement boost for your rides. 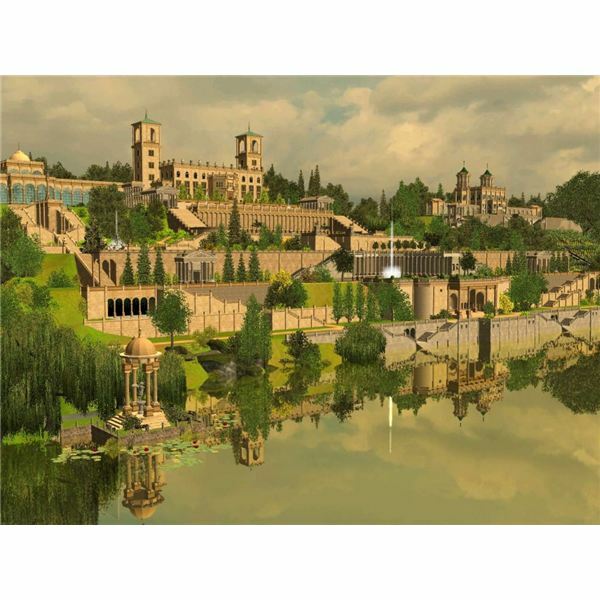 RCT3 themes take a significant amount of practice to get just right, so don't worry if you find yourself adding more and more scenery without any apparent effect. You'll want to add at least 100 unique decorations from a particular theme before it starts to come together. Sometimes, your park just isn't big enough. You'd love to fit that extra rollercoaster in there, but you can't find any space. When this happens, consider purchasing additional land or build rights to expand your park. In the park management tab, click on purchase rights or build rights. Unless the scenario doesn't have additional land to purchase or you've already bought it all up, you should see extra land with small white signs popping up around the edges of your park. Clicking on these tiles will then open them up for you to use just like any other land tile. However, you'd better have a deep piggy bank saved up for the occasion. Buying enough land to build a new roller coaster can cost more than the roller coaster itself. Don't bother buying new land until you have your loans paid off or tens of thousands of dollars saved up. You aren't a one man army, and you won't be taking care of your park by yourself. Yes, you'll make all the big decisions, but you don't want to busy yourself tending to the daily operations, which keep the amusement park running. That's why you'll need to hire staff. Staffing isn't really an "advanced" RollerCoaster Tycoon 3 strategy since you won't get far without them, but effective use requires a bit more finesse. Handymen clean up vomit and litter. Neglecting them can ruin your park rating, and a few scenarios are actually unprofitable (at first) because of the amount of rubbish along the paths. Mechanics inspect rides for safety and fix them when they're broken. You'll want at least one mechanic because broken rides don't generate any cash. The other three aren't as necessary, but they can be pretty useful to have around. Security guards make sure vandals don't ruin park benches and trash cans. If those are broken, you'll have to replace them. Although they only cost a dollar to replace, it can be a hassle. Entertainers make sure peeps in long queue lines don't grow upset. Animal keepers clean up after animals and make sure they're properly fed and watered. This is the one value which determines how many peeps will show up to your park. You can't control it directly; rather, it's an indicator of how fun and clean your park is. The higher your rating, the more peeps will show up. Basically, focus on constructing rides, making sure they work, and cleaning up the park so there's not litter and vomit everywhere. Roller coasters, especially big ones, can provide a significant boost to your park rating. The number of peeps in your park and their overall happiness can also add to your park rating, which will in turn attract more peeps. If you notice that you have a low park rating, check the score to see what's wrong. If litter or vomit is mentioned, hire more handymen. Is the ride excitement score low? Build a big roller coaster. A smaller park with a high park rating is, in many cases, more profitable than a larger park with a low rating. These strategies aren't the extent of what's possible in RollerCoaster Tycoon 3. You should always be experimenting and trying new things out to make the best new amusement park possible. However, these are the tools you'll use to start building a very profitable company. I prefer playing in campaign mode to give myself a slight challenge, but you can always boot up sandbox mode to try out literally anything at all without any consequences. Stop worrying about money or space. Just start building, and building, and building. 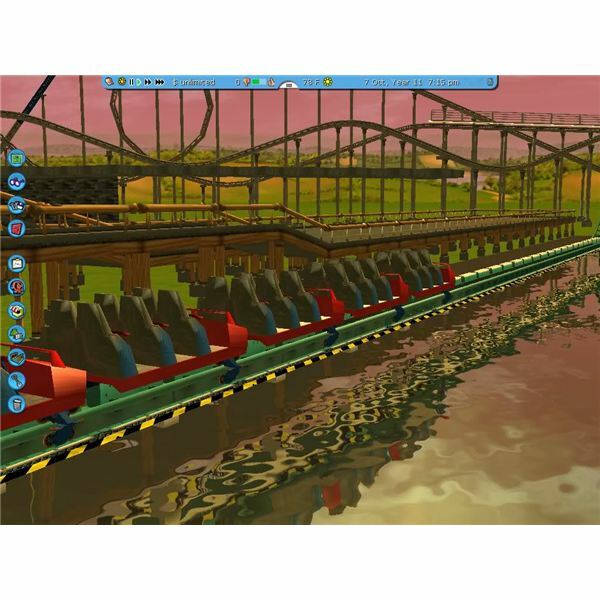 There are tons of active RollerCoaster Tycoon 3 communities online, all willing to share their ideas and their amusement parks with the world. Look to them for inspiration and creative ideas. With thousands of custom designs, buildings, and tracks available, you aren't even limited by what Atari put in the game. Frontier Developments. RollerCoaster Tycoon 3. Atari, 2004. Microsoft Windows.